James Grimaldi and I wrote these stories for the Orange County Register. They were published on July 19, 1992. High-speed pursuits by US Border Patrol agents have ended in at least 35 deaths and 225 injuries during the past decade, an investigation by The Orange County Register has found. The chases are considered so dangerous that as a matter of policy the California Highway Patrol refuses to let its officers join in. And the chases are costly: Area hospitals and taxpayers are stuck with hundreds of thousands of dollars in unpaid medical bills for injured immigrants and bystanders. These deadly pursuits in Orange County and elsewhere in Southern California most often start over immigrant smuggling _ a crime that the court system treats as minor. Smugglers in cases involving high-speed chases often spend less than two years in prison. If there’s no chase, the smuggler usually is let off with a misdemeanor and no more than six months’ jail time. Charges are rarely brought against the immigrants riding as passengers, the Register investigation found. And immigrants injured in crashes usually are allowed to go free because the government doesn’t want to be stuck with the hospital bills. Public outcry over the Border Patrol’s tactics has grown in recent weeks after a chase that killed six people in Temecula. undocumented immigrants just isn’t worth it. The Border Patrol’s chase policy doesn’t meet the minimum requirements for pursuits under California law. Border Patrol policy urges agents to exercise “reasonable safety” and common sense, while the state requires specific guidelines for beginning and ending pursuits. Local hospitals, patients and taxpayers are left with the tab for people injured in chases. Mission Hospital Regional Medical Center in Mission Viejo, for instance, reports that pursuits have cost the hospital more than $600,000 in the past six years. Top Border Patrol officials refused to provide a tally of chases or to release reports on accidents. They talked only generally about the agency’s policies. “The alien smuggler is not just a benign person,” he said. Agents say the high-speed pursuit is a crucial weapon in trying to stop the estimated 1 million immigrants who slip into California illegally every year. They say if they don’t chase cars that fail to stop, their authority would be undercut and illegal immigration would reel out of control. And they resent the criticism. Still, the public outrage over high-speed chases continues to spread. In the most recent fatal pursuit, on June 2, a Chevrolet Suburban packed with illegal immigrants roared through a school zone in Temecula, crashed into a car and careened into two students walking to school. Four high school students, a parent, and an undocumented immigrant in the Suburban were killed and a dozen people injured. The owner of the Suburban, stolen from Mission Viejo Mall the week before the crash, isn’t so sure. “There is no reason to get in a high-speed chase and act like a cowboy for a stolen car,” said Brad Rambo, 32, a Capistrano Beach businessman. Eleven immigrants died when a car smashed into a hay truck in Coachella in 1983. A 4-month-old baby was smothered to death when a speeding van overturned in San Ysidro in 1987. A mail carrier on his way to work was left paralyzed when a car barreled through a stop sign and collided with his truck in Temecula in 1989 _ three years before the June 2 tragedy. These deaths all occurred the same way: US border agents tried to pull over a car, truck or van filled with illegal immigrants. The driver refused. And another high-speed chase was on. Such chases occur all along the 1,933-mile US-Mexico border. But many begin at the Temecula and San Clemente checkpoints, the stations about 50 miles from the border on the San Diego (I-5) Freeway and the Escondido (I-15) Freeway where agents stop cars and ask the citizenship of passengers. And dozens of pursuits end in residential areas in Orange and Riverside counties. Border Patrol agents must file reports when they conduct high-speed chases, according to the agency’s pursuit policy. But representatives for the Border Patrol and the immigration service refused to provide any of these reports. 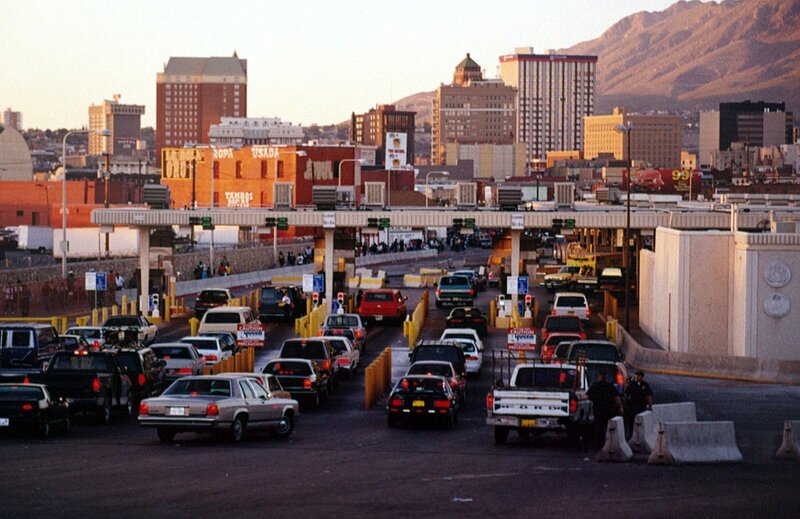 A 1984 Border Patrol study _ the most recent figures released publicly _ estimated that about 300 pursuits occur every year along the US-Mexico border. Every time a law-enforcement officer begins a chase, there is a 1-in-3 chance of a crash; at least one in four chases ends in injury; and at least one in 100 in death, according to numerous national studies described in “Police Vehicles and Firearms: Instruments of Deadly Force,” a compilation of research on police chases. The previous two chiefs of the CHP’s Border Division have turned away repeated pleas from high-ranking immigration officials to assist in the pursuits except in non-immigration cases. Harold Ezell, the former regional immigration commissioner in the western United States, said he met three times with CHP officials to talk about their refusal to cooperate. “I thought it was an outrageous position for them to take because the freeways are the responsibility of the highway patrol,” Ezell said. CHP officials declined to publicly criticize Border Patrol chases. Clarence Tuck, chief of the highway patrol’s Border Division, said pursuits require special training and self-control, and even good, well-trained officers make mistakes. Some cities and states _ stung by victims’ lawsuits and nudged by insurance companies _ are adopting stricter standards for chases. Officers in Tampa, Fla., and Little Rock, Ark., among other cities, pursue only violent felons. Baltimore has banned all high-speed chases for 10 years. But in California, police and Border Patrol officers are immune from lawsuits if agencies have adopted several elements outlined in a state law. These state requirements are so lenient that even the law’s author says he will amend the law to require that the policies be stricter or to repeal the immunity for police. The pursuit policy of the Border Patrol doesn’t even meet state minimum standards, a federal judge in Santa Ana ruled last year. John Quirindongo, a former agent now living in Chula Vista, used to support the agency’s tactics. But now he believes they are wrong, in part because he was involved in one of the worst tragedies in the Border Patrol’s history _ a 1983 pursuit in which 11 illegal immigrants were killed. Agents have a “Rambo mentality,” said Roberto Martinez, head of the American Friends Service Committee, a Quaker group that monitors violence along the border. Last year, the average sentence for immigrant-smuggling cases was 10 months in prison, federal court statistics in Los Angeles show. Even in chases that end in a serious collision, the driver and undocumented immigrants sometimes get nothing more than a trip back to Mexico. Consider what happened to Cisco I. Hernandez, 18, of Mexico. He drove his Isuzu pickup _ with three adults and a 2-year-old child in the back _ past the Border Patrol checkpoint and onto Camino Real in San Clemente in 1990. There, border agents began to chase him. Hernandez’s truck slammed into a Volvo driven by Linda Chaffee, 44, who was taking her two sons to school in San Clemente. The boys escaped major injury, but Chaffee suffered a gash next to her right eye that damaged her eyesight. Injuries left her in pain for a year. The US Attorney’s Offices in Los Angeles and San Diego said they have no record of any criminal charges filed against Hernandez. In five high-speed pursuit cases in the past 10 years, the drivers were 19 or younger. In those chases, nine people, including a pregnant woman, were killed, and 70 were injured. 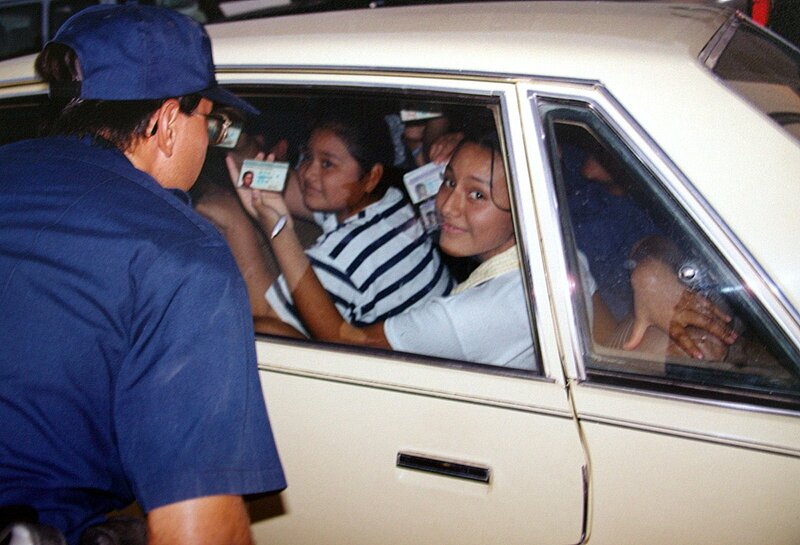 Smugglers usually recruit one of their customers to drive. They tell immigrants they can ride free or pay a reduced rate for driving, said Nancy Kendall, a lawyer with Federal Defenders. The drivers often are poor and impressionable, Kendall said. In many cases, they are so young they could not get a license in California and so inexperienced that they careen wildly on roadways during pursuits, court records show. Kendall represented a man in a 1990 high-speed chase in which a 17-year-old girl was killed. Kendall said the man wasn’t the smuggler and barely knew how to drive. Fear is the main motive for those who fail to stop during Border Patrol pursuits. “I know it’s not right, but I had no choice; there was no choice,” said Ruben Celis Perez, awaiting trial at the Metropolitan Correctional Center in San Diego on a charge of immigrant smuggling. Celis’ car collided with another car, injuring the driver. After the June 2 Temecula accident, Immigration Commissioner McNary said the smuggler, not border agents, were to blame. McNary’s stance blaming smugglers is one repeated by immigration officials after every chase-related wreck reviewed by the Register in the past decade. “I am deeply saddened at the deaths of six people caused by the appalling and reckless act of an uncaring smuggler of illegal aliens, but I am convinced that the INS officers involved acted responsibly,” McNary said. T.J. Bonner, Border Patrol union representative, said “the public has a right to be outraged” about the injuries and deaths that occur during chases. But the rage, he said, should be directed at the smugglers. Most agents feel sympathy for border crossers and realize that most are only coming here to try to find work, he said. He said the perceived lack of public support for the Border Patrol makes the job more difficult. There is a high turnover rate, and the starting pay of $20,000 makes recruiting difficult. Imperial County Sheriff Oren Fox said the Border Patrol’s methods are sound “for the most part,” and agents usually cut off chases in populated areas. Since the Temecula crash, politicians have vowed to make changes. It is a familiar refrain. In 1978, then-US Rep. Bob Badham, R-Newport Beach, and the San Clemente City Council met with Border Patrol officials after three high-speed chases through San Clemente that ended in fatal crashes. The Border Patrol promised to make significant, but undisclosed, changes in procedure. Still, high-speed pursuits continued. This time around, two congressional subcommittees will hold hearings _ on July 30 and August 5 _ to examine the Temecula accident and review the need for high-speed pursuits by the Border Patrol. McNary has been formally requested to appear. “We want to determine whether the policy needs to be changed,” said Rep. Ron Packard, R-Oceanside. Temecula Mayor Pat Birdsall, whose city failed in an attempt last month to ban Border Patrol pursuits on its streets, isn’t giving up. “I don’t want to run the Border Patrol out of town, but we want to change their policy and procedure,” Birdsall said. The Immigration Law Enforcement Monitoring Project, sponsored by the Friends service committee, has asked the US attorney general to declare a moratorium on high-speed chases. The project, based in Houston, said it might launch a national campaign to ban chases. San Clemente Mayor Joe Anderson said the Border Patrol usually advises city police when a chase is headed their way, allowing officers to post themselves at off-ramps. That is done to stop the fleeing motorist from getting off in San Clemente and possibly wreaking catastrophe on city streets. Anderson questions the wisdom of the San Clemente checkpoint. Even now, John Quirindongo plays it over in his mind: The desperate chase along a quiet stretch of Highway 86. The image of a Ford Galaxy speeding off into the night. The horrible crash. The victims, twisted, bleeding, gasping for breath. Eleven people were killed that night in 1983 in one of the worst chases in US history. Quirindongo, the Border Patrol agent who started the pursuit, said the tragedy and its aftermath just about destroyed him. Quirindongo, 37, of Chula Vista contends that the Border Patrol didn’t do anything to help him through his troubles. And he believes that’s because he broke a taboo few years earlier: He spoke out, alleging racism within the Border Patrol. “I was labeled a troublemaker,” he said. Neither the Border Patrol nor federal immigration officials would comment on his accusations. Quirindongo’s claims, saying Quirindongo never should have been hired as a border agent. Quirindongo, of Puerto Rican ancestry, entered the Border Patrol Academy in October 1977. He hoped it would lead to a better job, maybe with the FBI. “We’d go on five-mile runs every other day. We’d wear combat boots, green fatigue pants, a T-shirt and a Border Patrol cap. We’d sing about how we were going to hunt down those wets. PT was short for physical training, and Quirindongo said there was plenty of that. By the time he left the academy, he was eager for his first assignment. “I was very young. Gung-ho, mean green,” he said. He was posted in Chula Vista in February 1978. Quirindongo said that when he complained about racism, his bosses said he couldn’t get along with co-workers. Rather than be fired, Quirindongo said he resigned in July 1978. He complained to the US Equal Employment Office and was reinstated in February 1980. Quirindongo said he continued to hear racist comments at the agency, but few people spoke up. “Just like there’s a code of silence in the Los Angeles Police Department, there’s a code of silence in the Border Patrol,” he said. discrimination in assignments and promotions. Immmigration officials investigated and one supervisor was reassigned. Quirindongo said agents are part of a subculture with its own rules and jargon. He said agents regularly insulted illegal immigrants in Spanish: They called them “mugrosos” _ dirt balls. And “putas” _ whores. They also called them tonks. Quirindongo said he’s not sure how that started. According to one story, “tonk” is the sound made when an agent hits someone in the head with a flashlight. By 1983, Quirindongo was stationed at El Centro in Imperial County. He was considered a senior agent and knew all about high-speed chases. On Aug. 10, 1983, Quirindongo and his partner, Benito Pacram, were on patrol. About 1:30 a.m., they saw a Ford run a stop sign. The rear of the car sagged, as if loaded with people. Quirindongo said he followed the car north on Highway 86 to get a closer look. But the car sped off. Quirindongo said he chased the Ford into Riverside County, then lost sight of it. He said he didn’t see the crash. An 18-wheeler carrying 25 tons of hay smashed into the car, broadside. Eleven immigrants died. Immigrant advocates demanded an investigation. Quirindongo said the Border Patrol absolved him, but the “sounds, smells and shock of so many dead people” were seared into his mind. Border Patrol officials declined to comment on the crash. Quirindongo said he began having flashbacks after the crash. By August 1984, he said he realized he needed medical help. But the Border Patrol, he said, came up with petty complaints about his performance and pressured him to leave. Quirindongo went on medical leave and was fired in October 1984. He took his case to the US Department of Labor, asking for disability payments for post-traumatic stress. Payments were authorized in November 1986, records show. But he said the memories, the guilt, the second-guessing continue to haunt him.